One of our Wine Predator summer 2012 highlights was a twitter tasting that featured Rodney Strong wines. I’m guessing that this summer Rodney Strong wines will be a highlight as well! Last summer, we tasted several Rodney Strong wines: Sauvignon Blanc, Knotty Vines Zinfandel, and Symmetry. 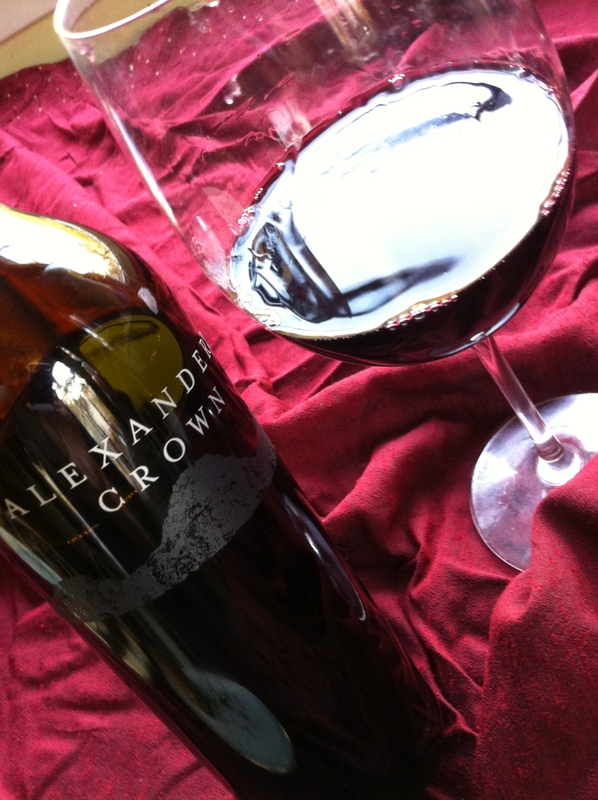 Getting in the mood for Wednesday’s blending party with Rodney Strong wines at the Pierpont Inn, I opened their Chardonnay one night and their Alexander’s Crown Cabernet Sauvignon on another night. To Rodney Strong Vineyards, “place matters.” One of the oldest wineries in Sonoma County, it was started by the charismatic and handsome Rodney Strong, a retired dancer. Family owned and carbon neutral, their certified sustainable practices start with the earth with soil and water conservation and reach toward the sky with solar power (one of the largest by any winery in the world!). They are also one of the rare businesses that are committed to the Triple Bottom Line of Planet, People and Profit, meaning they are not just concerned about making money but taking care of the planet and their employees through social equity. Below are notes on each of these wines from Rodney Strong. And watch for an upcoming post with pictures and stories from our experiment in blending! Named after Rod Strong’s wife, Charlotte, this vineyard was planted in 1971. Winemaker Rick Sayre combined cooler citrusy Russian River fruit with grapes from the warmer Alexander Valley with more melon and pear to provide lots of complexity. The 90% stainless steel cold ferment with 10% ML in French barrels produces a wine that has those lots of crisp freshness on the finish with a little richness from the oak. We loved this wine with oysters, goat cheese, sourdough bread, and it was just amazing with the arugala, ricotta, proscuitto, and roasted stone fruit salad. We also do this salad with smoked trout and this wine would be perfect with it. 13.5% alcohol. These 15 acres of vines were planted in 1904. 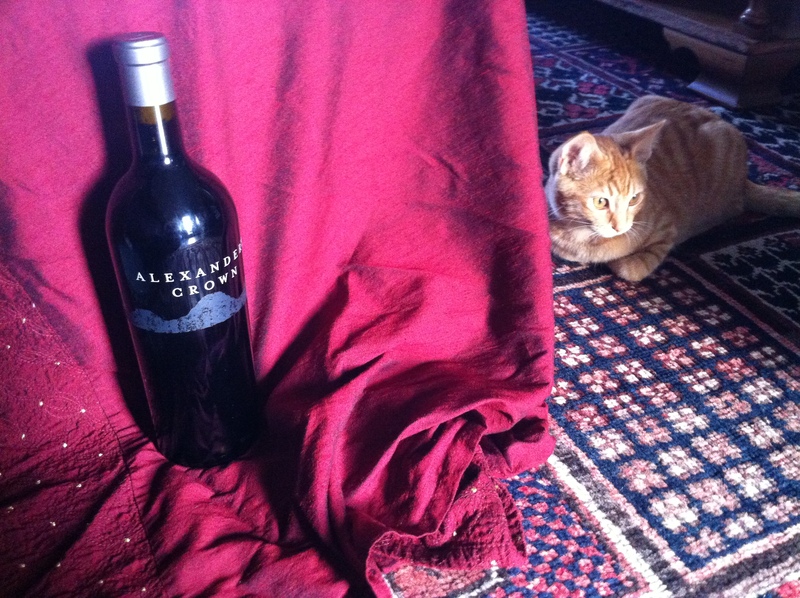 Grapes also come from the Alexander Valley. Very dense in color and flavor. Aged for 16 months in French and American oak. Reminds us of picking fresh blackberries by the creek and popping them in our mouths! Nice and jammy but with plenty of acid to keep the fruit bright and food friendly. We boiled some kielbasa sausages in beer special to pair with this wine and we truly were rewarded–yum! This would be a great wine with a grilled pizza with sausage. These can be really fun to do at a summer party–put out different ingredients and let everyone build their own! The 2009 Symmetry is 79% Cabernet Sauvignon, 14% Malbec, 6% Merlot, 1% Cabernet Franc, and 100% wonderful. The best of the best is selected and aged in French oak. This wine is a BIG BOY in every sense –15.5% alcohol, and super intense. And it needs a BIG glass–by the time we got to this wine, the table was a hodge-podge of glasses. I had to search around for a big Bordeaux glass so we could realy swirl it and release it! Dark rich cherry flavor, balanced, perhaps a bit too much oak at this stage but this wine was made to last. 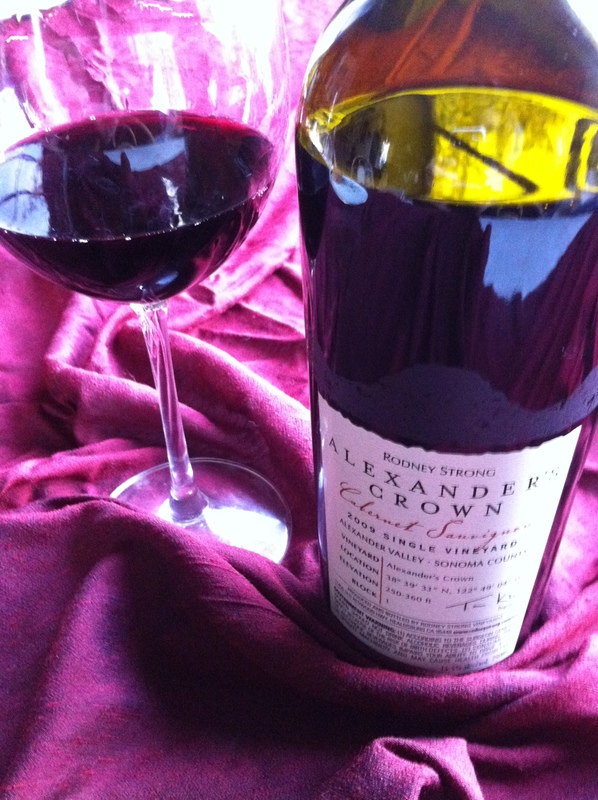 Henny tweeted: “resurrected from Cleopatra’s Alexandria” which means mmmmm afterglow…” I tweeted that I’d pair it with wild game–venison steak for example or wild game burgers. I had to hide the bottle to save a glass for the next day! Will we achieve such Symmetry tomorow when we try our hands at blending wine from Rodney Strong? I hope so! Goldilocks would love this wine. Why? What I like most about this wine is that it’s not too much like a California chardonnay but it’s also not so acidic that it’ll take the enamel off your teeth. It’s not all tropical fruit and it’s not all green apple. It’s not too buttery–your palate feels clean and fresh, with a long spicy finish. And because of this balance, it would go well with a greater variety of foods. I paired it with grilled lobster tail with spinach and ricotta raviolis in a creamy pesto sauce with a mildly spicy Italian turkey sausage and broccoli. This was about as good as it gets– I just wished I’d remem bered to saute the mushrooms in the fridge! This is a great chardonnay for the chardonnay fan and for the ABCer! Everything about this wine is impressive: the deep dark bottle has big broad shoulders, a substantial heft, and a serious punt. The etching on the label feels sensuous, and when you rub your fingers on it, it even sounds sensuous. The wine is inky dark in the glass, with a beautiful violet ring around the edge. The nose is racy, inviting, seductive–complicated notes of herbs, spice, vanilla, and jam. You don’t want to just drink this wine, you want to eat it! Seriously, you want to invite this wine to dance on the tip of your tongue, and as you swirl, you fight the urge to swallow, but you do. You promise yourself to go slow the next time, but you know you want it, and before you know it, you’ve swallowed that mouthfull as well. While I loved this wine with my steak, organic baked potato, and grilled vegies, this is a feel good wine you could enjoy hanging out with on a summer’s night…or a fall night…or a winter’s night…by the fire with friends or by yourself with your thoughts because this wine lends itself to contemplation. I love it now, and I can only imagine how good it would be if I’d waited longer to open it. This would be a great gift for someone who has a special birthday or anniversary. On the other hand, this is a wine that would make any day a special occasion. Or choose it for Cabernet Day coming up the last Thursday in August!